Home Inspections performed in : Parma, North Ridgeville, Lakewood, North Olmsted, Avon, Avon Lake, Rocky River, Westlake, Bay Village, Brookpark, Brooklyn, Fairview Park, Strongsville, Cleveland, Parma Heights, Berea, Middleburg Heights, Olmsted Falls, Elyria, and Lorain. A home inspection is an objective visual analysis of a home`s structure and mechanical systems. An inspection will determine the areas of the home that are not performing properly, as well as items that are beyond their usefull life or are unsafe. Inspections include areas of the home`s interior and exterior, from the roof to the foundation and the exterior drainage and retaining walls. If problems and symptoms are found, the inspector may recommend further evaluation. We also will give you solutions to the deficiencies so you may make a better judgement without calling for estimates for each deficiency. A home inspection is a visual inspection to determine problems and conditions that exist at the time of the inspection. What To Look For In A Home Inspector? Find out how much experience a potential inspector has. If an inspector has not been performing inspections very long, this probably means they don`t have the experience nor the insurance to adequately protect you. Is the inspector a member of a professional Home Inspection organization? Companies that are affiliated with professional organizations are serious about what they do, and they know about all the new developments in their fields. They are continually informed about changes in the building codes and city codes that make changes. 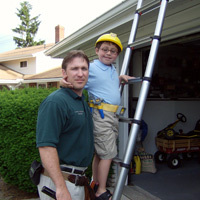 Their are several other local organizations that provide support for Home Inspectors in a certain state or region. Does the inspector carry Professional Liability Insurance (Errors and Omissions Insurance)? Make sure you ask for a copy of their liability insurance policy. If you ever need to collect on a legal judgment, the inspector's insurance policy may be able to pay on your claim. An inspector without insurance may not be able to pay your claim. A C.I.S. home inspector's report will review the condition of the home's heating system, plumbing, electrical system and central air conditioning system (temperature permitting), as well as the roof, attic, visible insulation, walls, ceilings, floors, windows, doors, foundation, basement, landscaping, and visible structure. We also provide gas testing and moisture detectors for basement moisture with as a part of each inspection. Each home inspection company has their own pricing structure. Inspection fees vary based on the area of the country and the type, size, and features of the home or building. Most inspectors will charge extra for services such as radon testing, termite inspections, well and septic inspections. A typical inspection fee for a 2,000 square foot home varies from $190 to $500. The cost of the inspection should not be the only consideration for hiring an inspector. A good inspection that informs you of all the potential problems in a home is worth the money. A bargain inspector may give you an inferior report. Once you have purchased the home, it may be very costly to repair problems that were omitted from the inspection report. Most home buyers will look at a home that they want to purchase and look for reasons to purchase the home. The prospective home buyer is not able to look at the home with the unbiased critical eye of a home inspector. Even a home buyer with construction experience does not have the knowledge and tools of a home inspector. A C.I.S. inspector is trained and experienced in finding the clues in a home that indicate problems. These clues are sometimes very subtle and hard to find. Most inspectors use tools that help them determine problems. Some inspectors have performed hundreds of inspections, and they are familiar with problems with certain building materials or building styles. Crown Home Inspections have preformed well over 3000 home inspections. When Purchasing a Home When Should I Call For a Home Inspection? We recommend that you are present at the inspection. C.I.S. inspectors will allow you to be there and ask questions after the inspection is completed. C.I.S. inspectors will point out the areas that are potential problems. This is important because you will be able to see for yourself the extent of problems that are sometimes hard for an inspector to convey in a report. C.I.S. inspectors will also show you how the heating system works and show you what things will need to be maintained in order to keep the home in good condition. Almost all homes will show problems. Even newly constructed homes will have problems noted on an inspection report. This is why we recommend an inspection even for new construction. Your C.I.S.inspector will be able to identify major problems that will be costly. Minor problems are to be expected and can be repaired after closing. Major problems may require a negotiation between you and the seller as to how to fix the problems. A seller may adjust the purchase price or contract terms if major problems are found. If the problems are costly, you will be able to make your decision about purchasing the home with the proper knowledge about the future cost of that home. Why you should get a home inspection! Certified ASHI inspectors and Licensed Radon Testers in the state of Ohio. Ashi is the only national home inspector organization that requires its members to pass the National Home Inspector Exam ( NHIE). The NHIE is used by over 22 states as their licensing exam for home inspectors. To sum this all up ASHI inspectors have more experience and knowledge...isnt this who you want to show up for your inspection. We are open seven days a week with as little as 48 hours to schedule your home inspection. We offer flat rates that do not change with the square footage of the home. We also provide you with a detailed computer-generated report on-site, at the time of the inspection. The inspection provides an invaluable learning and discovery experience during which your questions can be answered on the spot. We encourage you to accompany us during the inspection. A thorough home inspection will include the following... After the inspection, we will provide you with your own copy of the report. In addition, all of our clients are offered free telephone consultation after the inspection and access to your inspection online. Request your inspection today. We look forward to working with you! Crown Home Inspection Solutions is proud to be serving all of the Greater Cleveland area and surrounding suburbs. We also serve the Akron and Canton areas for all of your home and radon testing needs. C.I.S. also serves the following counties: Ashland County, Cuyahoga County, Geauga County, Summit County, Lorain County, Lake County, Portage County, Medina County, Stark County, and Wayne County. Our home inspectors perform home inspections in the following cities: Avon, Avon Lake, Amherst, Andover, Ashland, Aurora, Bainbridge, Bay Village, Beachwood, Bedford, Bedford Heights, Bentleyville, Berea, Birmingham, Bratenahl, Brecksville, Briarwood Beach Village, Brighton, Brimingham, Broadview Heights, Brook Park, Brooklyn, Brooklyn Heights, Brunswick, Brunswick Hills, Canfield, Canton, Carlisle Township, Chardon, Chagrin Falls, Chagrin Falls Township, Chatham, Chester Township, Chesterland, Chippewa-On-The-Lake, Cleveland, Cleveland Heights, Columbia, Concord, Cuyahoga Heights, East Cleveland, Eastlake, Eaton, Eaton Township, Elyria, Euclid, Fairport, Fairview Park, Garfield Heights, Gates Mills, Glenwillow, Gloria Glens, Granger, Green, Guilford, Harrisville Township, Highland Heights, Highland Hills, Hinckley, Homer, Howland, Hudson, Hunting Valley, Independence, Kirkland, Kipton, LaFayette, Liverpool Township, LaGrange, Lakeline, Lakewood, Leroy Township, Liberty, Linndale, Litchfield Township, Lodi, Lyndhurst, Macedonia, Madison, Maple Heights, Mayfield Heights, Mayfield Village, Medina, Mentor, Middleburg Heights, Moreland Hills, Newburg Heights, North Eaton, North Olmsted, North Randall, North Ridgeville, North Royalton, Oakwood, Oberlin, Olmsted Falls, Olmsted Township, Orange, Painsville, Parma, Parma Heights, Penfield, Pepper Pike, Perry Township, Poland, Richmond Heights, Rocky River, Saint Clairsville, Seven Hills, Seville, Shaker Heights, Sharon Township, Sheffield Lake, Sheffield Village, Solon, South Euclid, South Russell, Spencer Township, Strongsville, Steubenville, Stow, Timberlake, University Heights, Valley View, Vermilion, Waite Hill Village, Walton Hills, Wadsworth, Warrensville Heights, Westfield, Westlake, Wickliffe, Willoughby, Willoughby Hills, Willowick, and Woodmere. Crown Inspection Solutions provides general home inspections, radon testing, prelisting or sellers inspections, radon inspections, radon mitigation, construction draw inspections, lender required inspections, siding or roof inspections, commercial building inspections, apartment building inspections, wood destroying insects, and other inspection services all performed under the ASHI standards and Code of Ethics. All of our inspectors are ASHI members in good standing, and or ASHI C1 or C2 , NAHI and or NACHI inspectors. ***With the sale or listing of a home, home inspections are often needed to finalize the proceedings. Home inspections are intricate looks at the finest details of a home. It is the home inspection that will tell a home buyer whether or not the home is safe for purchase and habitation. So, when choosing a home inspector for your home inspection, you need to ensure only the most trained inspectors will be looking through your walls. A professional home inspector is more than simply a person that looks throughout the home for dings, holes and water leaks. Home inspections are detailed surveys that gauge the overall status of the home's condition. When choosing a home inspection service, make sure they are trained in the latest home inspection codes, rules and regulations, as well as, being certified to perform a home inspection. In conjunction with being certified, the home inspector you choose should be responsible, professional, unbiased and experienced. The company should carry liability insurance for the safety of both the homeowner and the inspector. Memberships to the American Society of Home Inspectors, National Association of Home Inspectors or any local home inspection guild is also a very good sign. General home inspections are the final step before purchasing a home. The home inspectors report holds great weight with the buying family. But, home purchases are not the only use for home inspections. When listing a home for sale, allowing a certified home inspector to walk through the home and write a report on the dwelling will provide buyers with that ever so valuable information before making an offer on the home. Building inspections can be completed with hours, but reports can often take days to compile. Rest assured, with Crown Home Inspection Services, you will receive that report within minutes, not days. Crown utilizes the most up to date report generating software to print off an instant report of the home. This precious time can mean the difference in securing that sale or offer from a potential home buyer. If you are ready for a totally impartial body to walk through your home and inspect the ins and outs of your walls, call Crown Home Inspection Services. Crown works with homeowners on a seven day a week bases with most inspections being scheduled within 48 hours of the first call. Fast service, attention to detail and an unbiased look. Crown's certified home inspectors will make sure the home you are in is the best one for you. We offer a wide range of services geared specifically towards real estate professionals.